Ahead of the holiday recess, Congress on Friday overwhelmingly passed a sweeping $1.8 trillion spending bill – heavily larded with hundreds of billions in corporate tax breaks along with billions for Israel’s killing machine. On Thursday, House members passed it by a 316-113 bipartisan majority. On Friday, Senate members followed by a nearly two-to-one 65 to 33 vote. The measure increases spending by $66 billion for the FY ending September 30, 2016 – above earlier sequester limits set. It ends a 40-year ban on crude oil exports, a sop to energy giants during hard times of low prices. Obama straightaway signed the 2,009-page measure into law. Perhaps no one but corporate lawyers, lobbyists, and others involved in crafting it read it. The Committee for a Responsible Budget estimates it’ll increase federal debt by at least $2 trillion in the next 20 years – likely much more given America’s rage for endless wars, additional appropriations accommodating them with bipartisan support. Congress approved $3.1 billion for Israel – with virtually certain add-ons more during the current fiscal year. Funding includes nearly $500 million for Israel’s missile defense program, $55 million for its over-hyped, ineffective Iron Dome, $40 million for US-Israeli tunnel detection, as well as considerable additional funding. It is a critical component of US commitments to ensure that the Jewish state maintains its qualitative military edge over its adversaries. In 2007, Washington and Israel signed a Memorandum of Understanding – pledging $30 billion to Israel for the 10-year 2009 through 2018 period. It called for $3.1 billion in FY 2016. It committed America to maintain Israel’s regional qualitative military edge, despite having no enemies except ones it invents. It assured continued US aid to meet phantom Iranian challenges, along with nonexistent Palestinian and Hezbollah threats. 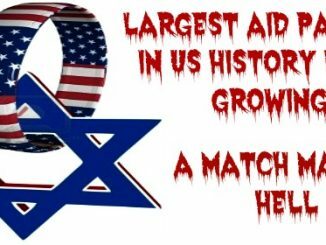 Looking ahead, Israel wants a 50% annual increase in US funding when the current Memorandum of Understanding expires – more for its killing machine to slaughter defenseless Palestinians, bomb Syria and commit other acts of state terror. Partnered with America, other NATO members and rogue Arab states, Israel threatens world peace and security. The more funding it’s provided, the greater the threat. Through December 18, its killing machine extrajudicially executed 127 Palestinians, including 25 children and six women. Over 14,700 were injured, including 4,700 from live fire and potentially lethal rubber/plastic-coated steel bullets. Hundreds of children were shot will live rounds, many more with coated steel bullets, causing fractures and other serious injuries. Over 9,600 Palestinians suffered the effects of toxic tear gas inhalation. Thousands were lawlessly arrested, dozens more daily. Since October 1, double the number of Palestinian children were imprisoned, treated horrifically under deplorable conditions. Around 600 Palestinians are held administratively uncharged and untried – entirely for political reasons, including five Palestinian Legislative Council members for belonging to the wrong party.